Flood insurance falls into what Howard Kunreuther (1996) coins the “natural disaster syndrome” in which low perception of risk and high prevention costs deter people from taking preventative action and purchasing insurance, despite the potential for extremely costly damages. This syndrome is coupled with a moral hazard: Residents in floodplains fail to insure because they recognize the government will inevitably bail them out because of public pressure and a desire to restore people to their previous states, among other factors. They therefore have little incentive to invest in flood insurance or floodplain management. With many communities ill-prepared for a potential flood and lacking insurance, floods, such as those caused by Hurricanes Katrina or Harvey, cause catastrophic and expensive damage. Federal, state, and local governments are left with little option but to declare a state of emergency and appropriate large sums of taxpayer money for the recovery costs. To address this natural disaster syndrome and achieve the goals of the National Flood Insurance Act of 1968, the US government should reform the National Flood Insurance Program (NFIP) to increase insurance uptake, improve floodplain management, and reduce federal disaster recovery costs. This paper examines current flood insurance laws, illustrates the need for reform, identifies optimal policy goals, and offers an analysis of potential alternatives. Based on the recommendations of the Bureau of the Budget Task Force on Federal Flood Control Policy (Goddard, et al. 1966), the National Flood Insurance Act of 1968 has three primary objectives: Better compensate individuals for flood losses via insurance, promote investment in floodplain management to prevent future flood damages, and reduce federal spending on flood disaster assistance (Federal Emergency Management Agency 2002). Every five years, the NFIP conducts a flood mapping process that evaluates base flood elevation for residential homes and buildings. Communities are assigned zones according to their likelihood of flooding. Special Flood Hazard Areas (SFHAs) include Zones V and A, both of which face an annual risk of a flood of 1 in 100 years or greater (Federal Emergency Management Agency 2002). The frequency and magnitude of this statistical probability means a 26 percent likelihood of a flood occurring during a 30-year home mortgage. Homes in SFHAs with mortgages backed or regulated by federal lenders are required to purchase and maintain a flood insurance policy. There are two sources for purchasing flood insurance. The first is state-licensed insurance agents who deal directly with the Federal Emergency Management Agency (FEMA), the administering agency of the NFIP. The second, more common option, was created by a program in 1983 called “Work Your Own” (WYO) policies, which essentially permits private insurance companies to develop and administer their own flood insurance policies to match the NFIP standards. The WYO program greatly expanded the number of policies purchased. Approximately 86 private insurance companies issue flood insurance, writing 95 percent of all flood policies nationwide (Federal Emergency Management Agency 2002). Currently, single-family households can purchase up to $250,000 in building coverage and an additional $100,000 for contents coverage (Kousky and Kunreuther 2013). Businesses can purchase $500,000 for building and another $500,000 for contents coverage (Kousky and Kunreuther 2013). In 2012 and 2014, the Biggert-Waters Flood Insurance Reform Act and the Homeowner Flood Insurance Affordability Act, respectively, made all policy premiums risk-based, eliminating government subsidies for certain households and structures (National Research Council 2015). The National Flood Insurance Act of 1968 has failed to accomplish its goals of high or universal insurance uptake, floodplain management, and reduced government disaster spending. First, current flood insurance coverage for households in the United States sat at only 12 percent in 2016, according to the Insurance Information Institute (Insurance Information Institute 2018). A McKinsey & Co. Report found the areas most heavily affected by the two biggest recent hurricanes to make continental landfall – Harvey and Irma – had uninsured rates as high as 80 percent in Texas and 60 percent in Florida (Michel-Kerjan and Taglioni 2017). This is well below the NFIP goal of flood insurance coverage (Federal Emergency Management Agency 2002). On top of normal access, all households in SFHAs with federally-backed mortgages are required to purchase flood insurance. Nevertheless, evidence suggests that this requirement is only weakly enforced for the first year of the mortgage, and policyholders often let their insurance lapse (Tobin and Calfee 2005). Second, many floodplain management strategies – elevating homes, sealing the foundations of the structure, waterproofing the walls, etc. (Kunreuther 2006) – could still be implemented to reduce the potential damages from flooding. Building codes are used to ensure floodplains are effectively managed and potential risk from damage is minimized. However, weak enforcement allows building codes to go unfollowed. After Hurricane Andrew in August 1992, insurance experts estimated that 25 percent of the insured losses from the hurricane could have been prevented by better building code enforcement (Insurance Research Council and Insurance Institute for Property Loss Reducation 1995). At the time the hurricane hit, Dade County, the worst hit area, had only 60 building inspectors working that year on a task load of 20,000 buildings per year. That amounts to 33 buildings per day per inspector, an unfeasible workload because building inspections takes two hours on average (Kunreuther 2006). Finally, nearly two-thirds of presidential disaster declarations between 1953-2010 were in response to flooding ( Michel-Kerjan and Kunreuther 2011). The frequency of flood disasters is likely to increase as climate change has increased the risk of flooding around the United States (Knutson 2010). Indeed, flood rates have already risen, placing the NFIP in substantial debt. The NFIP, which has a borrowing account from the Department of the Treasury, has been in debt since Hurricane Katrina in 2005 (United States Government Accountability Office 2017). Currently, the NFIP is on the U.S. Government Accountability Office’s 2017 “High Risk List” with a debt to the Treasury of $23 billion as of March 2016 (United States Government Accountability Office 2017). Increasingly frequent flooding events affecting populations with low insurance uptake will force Congress more often to appropriate funds to rehabilitate peoples’ lives. Any reform to the current National Flood Insurance Program should address the three policy goals originally laid out by the National Flood Insurance Act of 1968: First, maximize economic efficiency by minimizing the costs of flood damage and increasing levels of insurance coverage. Second, minimize government costs in terms of pre-disaster prevention spending and post-disaster recovery. Finally, ensure low-income individuals are not excluded from the flood insurance market, thus making the policy more equitable – and politically feasible. The Task Force on Federal Flood Control Policy enumerated in 1966 a set of “actions which can and should be immediately undertaken” (U.S. Congress House Committe on Public Works 1966). The actions include coordination of a better plan for development on floodplains and the creation of a national flood insurance program (U.S. Congress House Committe on Public Works 1966). These two impact categories reduce the economic costs of a flood. There are two main methods to promote better floodplain management. The first is through better enforcement of building codes. Many state and local governments implement building codes to promote development of houses and buildings with strong flood damage prevention measures. These building codes are evaluated by building inspectors, most of whom are hired by local governments. According to the Bureau of Labor Statistics, these workers make about $28.12 per hour. Considering a full-time work schedule of 2,080, that means the average inspector makes $58,480 (Bureau of Labor Statistics, U.S. Department of Labor 2018). Accurate Building Inspectors, a private company, explains that an average building inspection lasts approximately two hours (Accurate Building Inspectors 2004). Therefore, each inspector can inspect approximately 1,000 houses per year. The second form of floodplain management is flood proofing existing structures. The U.S. Census Bureau states that the average house size is approximately 2,500 square feet (Christie 2014). The private firm Dodge Data and Analytics, in a 2012 report on costs of wet flood proofing for a 5,000-sq. ft. home, estimates the total cost of implementation at approximately $42,144 (2012). After adjusting quantity purchased for a smaller building and adjusting prices for inflation, the cost in 2017 for an average U.S. home is approximately $22,537 (See Appendix A for calculations). This figure reflects the total cost to prevent flood damage and comply with NFIP regulations. Flood insurance costs approximately $700 per year for the average U.S. household (Lankford 2015). After the implementation of the Biggert-Waters Flood Insurance Reform Act and the Homeowner Flood Insurance Affordability Act, which eliminated premium subsidies, these premiums accurately reflect the risk for each household. Residential households can purchase more than the minimum plan, up to $250,000 in building coverage and $100,000 in content coverage. The average amount of insurance coverage under NFIP is $131,670, which includes both building and content coverage (Federal Emergency Management Agency 2002). This analysis uses the national average annual premium of $700. Because future disaster relief expenditure can be prevented by investment in prevention methods, we can divide government spending on flood damage into pre- and post-disaster expenditures. There are two main pre-disaster prevention programs: The Pre-Disaster Mitigation (PDM) program and the Federal Mitigation Assistance (FMA) program. PDM was developed to invest in mitigation projects that “reduce overall risk to the population and structures from future hazard events (Federal Emergency Management Agency 2018).” In Fiscal Year (FY) 2016, $90 million was granted to state and local governments to invest in these programs that prioritized cost-effective mitigation. The National Flood Insurance Reform of 1994 established the FMA to reduce the number of claims under the NFIP; $19.9 million was allotted in FY 2016 to provide grants to state and local governments for programs that implement flood mitigation on chronically risky properties (Federal Emergency Management Agency 2016). Post-disaster spending comes in two forms as well. First, the Disaster Relief Fund (DRF) is used in all presidential disaster declarations to recover and rehabilitate communities following flooding. Although the requested amount of funding for the DRF between FY 2002 and 2011 was $1.9 billion, the actual amount of money spent on average during that time frame was $4.2 billion, or $4.55 billion after adjusting for inflation. [i] The second form of post-disaster spending from the government is the Hazard Mitigation Grant Program (HMGP), which was developed to implement hazard mitigation programs immediately following a presidential disaster decree. These funds are made available as a proportion of the estimated total federal disaster assistance from FEMA. Any new policy should be politically feasible. Political feasibility is divided into two impact categories. The first is the probability of adoption, which considers the political context and the extent to which it departs from previous policy. The second category is equity, which considers if a policy would allow all people to participate and minimize adverse impacts of policy change on any group. Since the policy alternatives proposed here would require universal adoption regardless of income, equity is an important consideration. This paper considers current policy and two alternatives: stricter enforcement of building codes and mandatory insurance, and universal mandatory insurance with insurance subsidies. The current National Flood Insurance Program policy is the result of several acts and regulatory changes since the passage of the National Flood Insurance Act of 1968. Currently, after the two recent laws in 2012 and 2014, all premiums paid on flood insurance in the United States are actuarially fair according to risk as determined by the flood mapping conducted every five years in floodplain communities. To encourage investment in flood damage mitigation programs, access to flood insurance is restricted to communities that develop mitigation plans and building codes that match NFIP standards for that community (Federal Insurance and Mitigation Administration 2002). The number of insurance policies in force is increased by the requirement of all federally-backed mortgage holders to purchase and maintain a flood insurance policy. Nevertheless, enforcement of building codes and mandatory flood insurance policy requirements remain poor. Instead, when floods do occur, the federal government often feels obligated to help recover costs at the taxpayer’s expense. As previously mentioned, both the Disaster Relief Fund and the National Flood Insurance Program are in debt and unlikely to balance their budget in the near or distant future (United States Government Accountability Office 2017). Since current policies are often under-enforced, this alternative would simply allocate more funding to ensure stricter enforcement of both building codes and mandatory insurance for federally-backed mortgage holders. FEMA should request a temporary increase in budget and appropriate the additional money to the NFIP to create a building inspector grant program similar to the FMA or PDA but with an option for communities to easily renew their grant. These increased funds would come from general congressional appropriations and eventually pay for themselves. The change in funding would be temporary as long-term changes in building quality and insurance uptake would shrink NFIP budget in post-disaster spending. Grants would be allocated based on a simple application process that directs funds to areas where need and cost-effectiveness are highest. Additionally, households with federally-backed mortgages would be required to show proof of flood insurance at the same time they present proof of homeowner’s insurance to their mortgage holder, eliminating lapses in coverage. Currently, only households in Special Flood Hazard areas are required to purchase flood insurance as part of their homeowner’s insurance package. Under the proposed alternative, all households, regardless of flood proneness, would be required to purchase actuarially fair flood insurance. Flood insurance would be added to the requirements for all homeowners’ insurance policies, regardless of a household’s risk of flooding. Following the example of universal health insurance mandates in the US, proof of flood insurance would be shown to the Internal Revenue Service (IRS) when taxes are filed. To address potential inequality concerns, excess funding from premiums would be reallocated to low-income homeowners in the form of tax credits that can be paid in advance to the policy issuer. Similar to the program for the universal mandate in the Affordable Care Act, households with incomes up to 250 percent of the federal poverty line would be able to proactively apply their tax credit to a flood insurance policy and completely cover the insurance premiums. 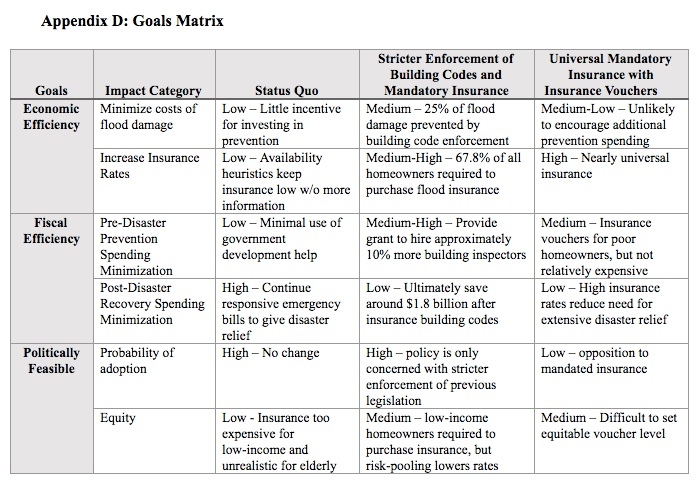 In the following sections, each policy alternative is assessed in terms of how it promotes the policy goals of the National Flood Insurance Program. For a concise comparison chart for the alternatives, see the Goals Matrix in Appendix D.
Economic Efficiency. The current policy is likely the least economically efficient among all of the alternatives. Under current policy, there is little incentive for homeowners to invest in hazard mitigation programs or purchase flood insurance. With the natural disaster syndrome of Howard Kunreuther in full effect, it is unlikely that either of these impact categories would change in the near future. In terms of minimizing the costs of flood damage, people would often be too myopic to invest in long-term damage prevention. Additionally, the shortage of building inspectors would mean that flood damage mitigation features for existing and new buildings will remain under-enforced. As the “it will not happen to me” (Kunreuther 2006) mentality continues uninterrupted with a policy change, the flood insurance rate would continue to stay at an abysmally low level of 12 percent. Political Feasibility. On the positive side, changing nothing is always stable because it requires no new action on the part of Congress or FEMA. However, the current policy is unsustainable. As previously mentioned, the GAO deemed the NFIP to be “high risk.” Moreover, with flood risk likely to increase due to climate change, the status quo will become harder to sustain. In terms of equity, the current policy provides no provision for the poor and elderly, who are less inclined and able to plan for the future, leaving the already vulnerable groups susceptible to the whims of nature. Economic Efficiency. Stricter enforcement of building codes and mandatory insurance would likely be highly effective at achieving the policy goal of improved economic efficiency. Stronger enforcement of building codes would significantly reduce the amount of damage from a flood. The Insurance Research Council and Insurance Institute of Property Loss Reduction, two industry research groups, estimated that 25 percent of losses from Hurricane Andrew could have been prevented if building codes were better enforced (Insurance Research Council and Insurance Institute for Property Loss Reducation 1995). The National Oceanic and Atmospheric Administration’s (NOAA) National Weather Service put the 30-year annual flood loss average at $7.96 billion annually (National Oceanic and Atmospheric Administration 2015). Therefore, if the estimates from Hurricane Andrew are accurate, then $1.99 billion in damages could be prevented annually from better building code enforcement. [iv] At a more conservative estimate of 10 percent avoidable damages, the amount saved would still be $796 million. Stricter enforcement of mandatory insurance for federally-backed mortgage holders would also significantly increase the flood insurance rate. Federal mortgage agencies – Fannie Mae, Freddie Mac, and Gwinnie Mae – hold a near monopoly on all mortgages, with 98 percent in 2016 and 99 percent through the first quarter of 2017 (Freddie Mac 2018). Therefore, nearly all mortgage holders in SFHAs are required to have flood insurance. According to the American Community Survey, 67.8 percent of all housing units have some sort of a mortgage, either directly for homeowners or indirectly for renters from the owners of their property (Chalabi 2014). Even at a conservative assumption that all of the 12 percent who currently hold flood insurance policies are already required to do so by law, stricter enforcement would increase the insured rate by nearly 500 percent. [v] Proof of flood insurance could then be included alongside proof of homeowner’s insurance, eliminating any associated costs. Fiscal Efficiency. Stricter enforcement requires hiring more building inspectors to ensure enforcement of building codes. Currently, there are 94,960 building inspectors in the United States. To support the hiring of more building inspectors, FEMA would develop a new grant program with guaranteed renewal, similar to the PDA and FMA, that provides funding for local governments. Hiring just 10 percent, nearly 10,000, more building inspectors would only cost $555 million annually. [vi] Through this method, FEMA would avoid additional administrative costs for hiring new inspectors, ensure funding is directed to the communities that need more inspectors, and implement the grant through a previously tested delivery method. Although pre-disaster spending would increase, the associated decrease in post-disaster government spending would more than offset it. Considering the federal government provides most of the bailout for people lacking flood insurance when a flood does occur, all reductions in flood damage would reduce government spending. After Hurricane Katrina, approximately 47 percent of the costs were covered by insurance (Basak 2017). At the same time, the Insurance Information Institute estimated that “only 10 or 20 percent” of the population who should have flood insurance in Alabama and Mississippi actually were insured (Schlach 2005). Therefore, a conservative assumption would be that half of all damages would be covered by insurance. Even with this assumption, a 67.8 percent insurance coverage level means the government would avoid $2.43 billion in damage spending annually (See Appendix B for calculations). Political Feasibility. This policy alternative has a high probability of adoption. The development of a grant program to ensure effective floodplain management through building inspections does not necessarily require any legislative action. The NFIP, which gets money from the National Flood Insurance Fund, has the authority to allocate the money as it sees fit. Therefore, all funding for building inspector grants could be redirected from post-disaster spending to pay for the program. Redirecting these funds would be revenue-positive because the amount of money saved from stricter enforcement of building codes and mandatory insurance would save the government much more money in post-disaster spending. If funds cannot be redirected in the short-term, Congress should appropriate a short-term budget increase for FEMA to allow it to build out the grant program and reduce long-term spending on NFIP. In terms of equity, this policy could face some pushback from some low-income homeowners who would be forced to purchase insurance. Nevertheless, for residents living in floodplains, purchasing flood insurance protects against catastrophic loss, which would exacerbate problems for low-income homeowners. While not directly within the scope of this alternative, FEMA could also re-appropriate money saved from stricter enforcement and provide subsidies to low-income homeowners. In addition, stricter enforcement of building codes is likely to decrease the premiums of actuarially fair mandatory insurance. Economic Efficiency. This policy would accomplish the goal of increasing insurance rates by raising the percentage of homeowners who own flood insurance to nearly 100 percent because flood insurance would be mandated by law for all people, regardless of flood risk. Every person who owns a home would have to show proof of insurance to the IRS, regardless of whether he or she owns the home in full or is still paying a mortgage, similar to the requirement for proof of health insurance after the Affordable Care Act. Homeowners would be required to show proof of insurance or face a fine greater than annual insurance premium costs. Proof of insurance would be required to be presented to the Internal Revenue Service similar to how citizens currently present proof of health insurance pursuant to the Affordable Care Act. While the insurance rate would rise, the costs of flood damage would remain unchanged as neither incentives nor requirements would dramatically change as compared to current policy. Fiscal Efficiency. Pre-disaster mitigation spending would necessarily increase as the federal government would now be required to provide tax credits in advance to anyone at or below the poverty line that would allow them to avoid their flood insurance premiums. Providing subsidies to all houses at or below the federal poverty line would cost only $19.5 million annually in tax subsidies. Even if the government were to completely subsidize insurance for those up to 250 percent of the federal poverty line, it would only cost $39.5 million to subsidize flood insurance (For calculations, see Appendix C). Most of the post-disaster government expenditures are directed to uninsured loss following a flood. Nevertheless, taking a conservative estimate that half of the losses from flooding would be covered by insurance, then universal insurance would reduce government post-disaster spending by $3.98 billion annually. Additionally, the risk-sharing of universal coverage reduces the likelihood of a catastrophic loss year changing such as that caused by Hurricane Katrina (Kousky and Kunreuther 2013). Political Feasibility. Mandatory insurance has a low probability of adoption. While it is likely to be more cost-effective than the current policy, it is also likely to be much less popular in the public eye. Since universal flood insurance would require passage of new legislation, disapproval from constituencies opposed to government mandates and concerned about equity would be a major barrier. However, compared to other alternatives, this policy best achieves the policy goal of promoting equity by subsidizing flood insurance programs and reducing the uncertainty low-income homeowners face. Based on economic and fiscal efficiency as well as political feasibility, this paper recommends that the legislature, specifically the Senate Committee on Homeland Security and Government Affairs, encourage FEMA to adopt a policy of stricter enforcement of building codes and mandatory insurance. The committee can encourage stricter enforcement with three different options. First, they can conduct normal oversight and inform FEMA of the potential benefit of stricter enforcement. If this fails, the second option would be through new legislation that directs funding toward stricter enforcement. Finally, when budget appropriations are passed, some FEMA funds can be earmarked specifically for stricter enforcement. While universal insurance would likely be the most cost-effective method of accomplishing the original goals laid out by the Task Force on Federal Flood Control Policy in 1966 (U.S. Congress House Committe on Public Works), the program is likely dead-on-arrival for many political groups that oppose heightened government regulation and mandates. Instead, stricter enforcement would only focus on government policies already adopted and ensure they are legally followed. Through stricter enforcement, government expenditures would go down, insurance rates would go up, and the cost of flood damage would fall, all possible without necessitating new legislation. Michel-Kerjan, Erwann, and Howard Kunreuther. 2011. "Redesigning Flood Insurance." Science Magazine, July: 408. Accurate Building Inspectors. 2004. "Building & Home Inspections." Accessed March 30, 2018. http://www.accuratebuilding.com/support/index.html. Basak, Sonali. 2017. "Harvey Costs Seen at Catastrophic Levels With Many Uninsured." Bloomberg. August 28. Accessed March 30, 2018. https://www.bloomberg.com/news/articles/2017-08-27/harvey-s-cost-reaches-catastrophe-as-modelers-see-many-uninsured. Bureau of Labor Statistics, U.S. Department of Labor. 2018. "Occuational Outlook Handbook: Construction and Building Inspectors." Bureau of Labor Statistics. January 30. Accessed March 30, 2018. https://www.bls.gov/ooh/construction-and-extraction/construction-and-building-inspectors.htm. Chalabi, Mona. 2014. "How Many Homeowners Have Paid Off Their Mortgages?" FiveThirtyEight. December 11. Accessed March 30, 2018. https://fivethirtyeight.com/features/how-many-homeowners-have-paid-off-their-mortgages/. Christie, Les. 2014. CNN Money: America's homes are bigger than ever. June 5. Accessed March 30, 2018. http://money.cnn.com/2014/06/04/real_estate/american-home-size/index.html. Dodge Data Analytics. 2012. 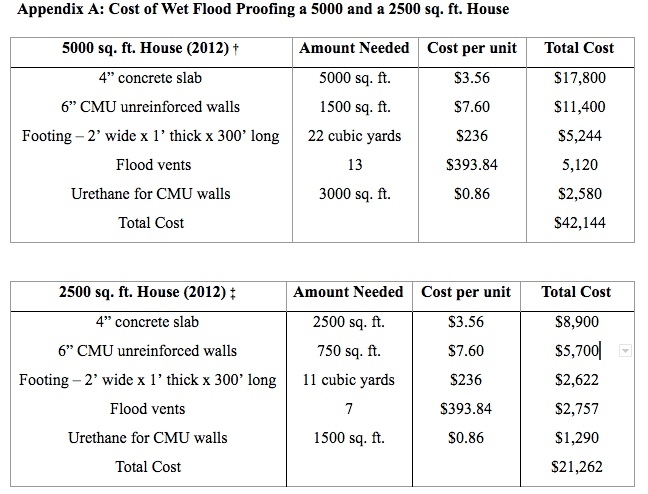 "Cost Analysis Comparison: Dry vs Wet Floodproofing Technologies." Construction.com. Accessed March 30, 2018. https://www.construction.com/CE/articles/2012/Smart_Vent_Cost_Analysis.pdf. Federal Emergency Management Agency. 2002. "Federal Insurance and Mitigation, National Flood Insurance Program Description." 2-38. —. 2016. "FY 2016 Flood Mitigation Assistance (FMA) Grant Program: Fact Sheet." FEMA.org. February 15. Accessed March 30, 2018. https://www.fema.gov/media-library-data/1455710459301-048a67862580037b30cd640a802a9053/FY16_FMA_Fact_Sheet.pdf. —. 2018. "Pre-Disaster Mitigation Grant Program." FEMA.org. March 26. Accessed March 30, 2018. https://www.fema.gov/pre-disaster-mitigation-grant-program. Federal Insurance and Mitigation Administration. 2002. "FEMA.gov." National Flood Insurance Program: Program Description. August 1. Accessed March 30, 2018. https://www.fema.gov/media-library-data/20130726-1447-20490-2156/nfipdescrip_1_.pdf. Freddie Mac. 2018. "Freddie Mac Investor Presentation." FreddieMac.com. March. Accessed March 30, 2018. http://www.freddiemac.com/investors/pdf/investor-presentation.pdf. Goddard, James E., Irving Hand, A. Richard Hertzler, and V. John Kurtilla. 1966. House Committee on Public Works Report 465, Washington, DC: U.S. House of Representative. Insurance Information Institute. 2018. "Spotlight on: Flood insurance." Insurance Information Institute. February 2. Accessed March 26, 2018. https://www.iii.org/article/spotlight-on-flood-insurance. Insurance Research Council and Insurance Institute for Property Loss Reducation. 1995. Coastal exposure and community protection: Hurricane Andrew's Legacy. Boston: Insurance Institute for Property Loss Reducation. Knutson, Thomas R. 2010. "Tropical Cyclones and Climate Change: An Indian Ocean Perspective." In Indian Ocean Tropical Cyclones and Climate Change, by Yassine Charabi, 47-49. Springer, Dordrecht. Kousky, Carol, and Howard Kunreuther. 2013. "Addressing Affordability in the National Flood Insurance Program."." Resources for the Future. Kunreuther, Howard. 2006. "Disaster Mitigation and Insurance: Learning from Katrina." American Academy of Political and Social Science 208-27. Kunreuther, Howard. 1996. "Mitigating Disaster Loss Through Insurance." Journal of Risk and Uncertainty 171-87. Lankford, Kimberly. 2015. Kiplinger: How Much Does Flood Insurance Cost? June 1. Accessed March 30, 2018. https://www.kiplinger.com/article/insurance/T028-C001-S003-how-much-flood-insurance-costs.html. Michel-Kerjan, Erwann, and Giambattista Taglioni. 2017. Insuring hurricanes: Perspectives, gaps, and opportunities after 2017. McKinsey and Company. National Oceanic and Atmospheric Administration. 2015. "Hydrologic Information Center - Flood Loss Data." National Oceanic and Atmospheric Administration: National Weather Service. May 14. Accessed March 30, 2018. http://www.nws.noaa.gov/hic/. National Research Council. 2015. Affordability of National Flood Insurance Program Premiums: Report 1. Washington, DC: National Academies Press. Schlach, Kathleen. 2005. "Many Katrina Flooded Homes Had No Insurance." NPR. September 9. Accessed March 30, 2018. https://www.npr.org/templates/story/story.php?storyId=4838689. Tobin, Richard J., and Corinne Calfee. 2005. The National Flood Insurance Program’s Mandatory Purchase Requirement: Policies, Processes, and Stakeholders. Washington, DC: American Institutes for Research. U.S. Congress House Committe on Public Works. 1966. A Unified National Program for Managing Flood Losses. Congressional Report, 89th U.S. Congress, Washington, DC: U.S. Government Printing Office, IV. United States Government Accountability Office. 2017. High-Risk Series: Progress on Many High-Risk Areas, While Substantial Efforts Needed on Others. Government report, Washington, DC: GAO.